UKSEE 2019: Uttarakhand State Entrance Test is a state level examination which is controlled by Uttarakhand Technical University. Through this exam, candidates will get the admission in MCA, BHMCT, M.Tech, B.Pharmacy, M. Pharma and MBA courses. It also organized a program for taking the admission in 2nd year of B.Tech, MCA, B.Pharma. Various private and government institute will give the admission on the basis of UKSEE Score Card. The UKSEE release the application form mostly in the 3rd week of April. So the candidates who are eligible can apply for the UKSEE. The applicant can fill the application form via online mode from the official site of the UKSEE. The information regarding the UKSEE Entrance Exam Dates is provided below in the table. 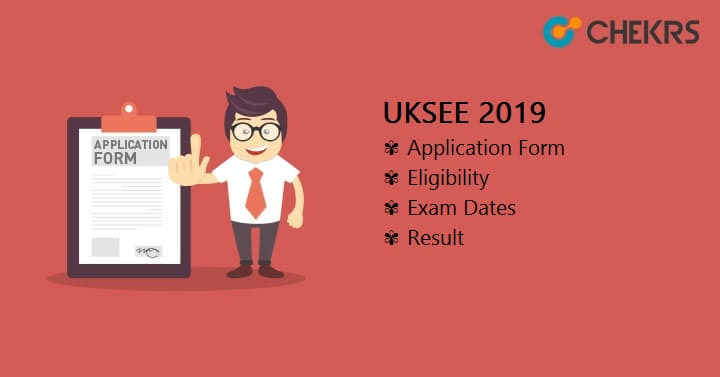 Applicants who are applying for the UKSEE Exam 2019 have to fulfill eligibility criteria. UKSEE Eligibility Criteria is given in the form of the qualification also. So before applying for the exam candidates must check for their eligibility. The UKSEE 2019 Eligibility Criteria is shown below. Candidates studying in the qualifying exam from the different state but hold the accommodation of Uttarakhand are acceptable for applying. Applicants who are appearing for the qualifying exam are eligible for applying. Candidates who passed the qualifying exam from the Uttarakhand is also eligible for applying. B.Tech(LE) B.Sc or equivalent exam and passed Diploma (engineering or technology), with minimum 45% marks and 40% for reserved category in qualifying exam. MCA Degree of Bachelors (3 years duration) with mathematics subject at 12th or graduation level, with 50% marks for general and 45% marks for reserved category. UKSEE releases the application form, in the month of April. So the candidates must be updated for filling the application form. The information regarding the UKSEE 2019 Application Form is provided on the official site. Here we provided some of the details regarding the Application form. UTU will release the UKSEE Registration Form/ Application Form in the online mode. Applicants are required to submit the separate application for different courses. Candidates have to upload the scanned photo of themselves with the prescribed format. Any appeal for a change in the exam center and category will not be considered. There is no need to send the print out of the application form in the university. Applicants who fill the application form have to submit the Application fees. Candidates can pay the fees via credit card/ debit card or net banking. The fee is divided according to the category. Once the application fee is submitted, it can’t be refunded in any of the cases. The detail for the UKSEE Application Fees is given below. Candidates who are applying for the Uttarakhand State Entrance Exam 2019 has to start the preparation. For that, they have to go through to the syllabus so that they can prepare only the valid topics. So we provided here the link to the UTU Entrance Exam Syllabus. The applicant can download the syllabus from the link given below. The exam pattern helps the candidate to know the type and no. of the question comes in the exam. Once the candidate familiar with the exam pattern then they have to face fewer difficulties in the exam. For the simplification of the candidate, we provided here UKSEE Exam pattern. Every candidate must require the preparation before going in the exam. The preparation helps them to obtain the good marks in the exam. So here we are providing some UKSEE Preparation Tips. Candidate can follow these tips for obtaining the good marks in the exam. Applicants are required to go through the syllabus and the exam pattern of the UKSEE exam. Always prefer the good study material. Solve at least last 10-year previous year question paper for getting the idea of the question paper pattern and format. The applicant can prepare the notes so that at the last moment they can go through it. UKSEE Result 2019 will be declared through the online mode on the official site. The result will be released along with the answer keys. The information regards the UKSEE Result Dates and the complete result will be advertised in the newspaper. A merit list will be prepared according to the marks obtained by the candidate. UKSEE counseling 2019 will be organized in the online mode in JUNE 2019. Student gets admission through the counseling on the basis of their merit list. Under the UKSEE Counseling, candidates are required to bring the original document for the verification purpose. Seats will be allotted to the candidate as the choice filled by them and the number of the availability of the seats.